Your Guide To Drinking This Weekend: The Mint Julep | Birth.Movies.Death. Learn the history and recipe for the perfect julep from Alamo Drafthouse beverage director Bill Norris. Set aside images of horses thundering down the final stretch of Churchill Downs and the 120,000 or so mint juleps that are consumed annually there on the first Saturday in May. Set aside visions of seersucker suits and ostentatious hats. Set aside the sickly sweet, or even worse, green tinged, crème de menthe filled monstrosities that are sometimes inflicted by bars of the wrong sort. Set aside pre-conceived notions of the mint julep, and embrace a potable that predates what we call cocktails by a wide margin, requires only a handful of readily available ingredients, and is so easy to make properly that there is never an excuse for a bad one. Juleps are a reminder to slow down, to have conversations with your friends on lazy weekend afternoons. They are easy sipping for sultry heat, front porches and lazy circling ceiling fans. They are perfect for large groups, because they are easy to assemble and lend themselves to being made in large batches. They can inspire rhapsodies. And, when the humidity is high and the heat is oppressive, a julep or three, sipped slowly, can restore some equilibrium to the body and the soul. As early as 900 AD, a Persian book, Kitab al-Mansuri makes reference to the word julāb, as a medicinal ingredient (in this case, a maceration of violets and sugar), and it remains a reference to medicine in repeated publication all the way until the late 1700s, with English translations using the word “julep” to refer to various medicinal macerations that sometimes, but not always used alcohol. Until suddenly, somehow, something changes by 1784 when British traveler John Ferdinand Smyth publishes his impressions of America and notes that in Virginia, workers “drink julap, made of rum, water, and sugar, but very strong.” One of the early American drinks, common in any tavern, would have been a sling, simply strong spirit lightened with water and sweetened with sugar, and what Smyth notes here is clearly a sling, but being called something else. Early Americans drank quite a lot, and quite often, and morning cocktails were often winkingly referred to as a kind of medicine, and that seems to be what Smyth has witnessed in Virginia, with a common medicinal term being used to hide the need for an eye-opener. Mint starts to appear in accounts around 1804, with some folks calling the drink, properly for the nomenclature of the time, a Mint Sling, until about 1820, when a mixture of spirits, water, sugar and mint is a julep for good. As to who first mixed one up; that is anyone’s guess. No one is recorded as the inventor of the julep, no one has come forth to lay any credible claim to the formula, a rarity for a drink that from the early part of the 19th Century until the Civil War was the most popular mixed drink in America, and available nearly everywhere mint and liquor could be found. Indeed, despite its probable origin in the Southern states (or colonies), and it’s laid back image, bars as far afield and urban as the Astor House in New York were famous for their juleps. Much like the Sazerac, the julep was largely a cognac drink when it first started to gain traction, but juleps were also commonly made with rum, whiskey (both Rye and Bourbon, though before the Civil War, whiskey versions were considered a touch vulgar), Genever, and in variations like the Georgia Julep, which featured brandy of the regular sort and a bit of aged peach brandy. During its early days, there were all sorts of fancy juleps, finished with garish fruit garnishes and chunks of pineapple, doctored with liqueurs and syrups, but right about the end of the Civil War, a standard julep starts to solidify, made as we would recognize it today, with bourbon, mint, sugar and crushed ice. The modern julep, when done well, is served in a silver julep cup, or at lesser establishments, in cups made of shined up pewter. Early julep recipes make no mention of metal vessels, but by at least 1816, silver julep cups were being awarded as prizes at County Fairs in Kentucky, and the current, most popular design is believed to be based on the work of Louisville silver smiths Asa Blanchard and William and Archibald Cooper, who introduced their julep cups in 1846. While these early silver vessels were probably meant to be ceremonial, to be used on occasions calling for the good silver and china, or when the in-laws popped over for a cocktail unannounced, metal cups, especially silver, play an important role in achieving a perfect julep. Silver has a thermal conductivity rating of 429 W·m−1·K−1 (in comparison, Stainless Steel is 16 W·m−1·K−1). In lay terms, the higher that number, the more easily the metal transfers changes in temperature. The reason that copper cookware (copper comes in at 401 W·m−1·K−1) is so beloved by chefs is that any flick of the dial on the range is transmitted almost immediately to the contents of the pan. Unfortunately, copper also has the potential to transfer toxins into the body if food or drink is consumed in or cooked directly on a copper surface, so copper cups are probably not the best idea. Silver, if used for the whole vessel, makes the julep cup prohibitively expensive (a 92.5% Sterling Silver cup is here for $495.00), but silver plated around a copper core is much more manageable in cost, quite fetching on the table, and almost as equally as conductive as a solid silver cup. So, why is this so important, besides the fact that it makes the drink look fantastic? Unlike most cocktails, the julep is neither shaken nor stirred. Instead, it is built simply in the glass, starting with sugar and mint leaves lightly pressed into the bottom of the serving glass, before a goodly portion of crushed ice is added, enough to make a mound of it over the top of the glass. Only then is the spirit poured over the crushed ice and allowed to mingle of its own volition with the rest of the drink. The thermal conductivity of silver and/or copper means that all of that ice quickly makes the julep cup very, very cold, which in turns slows the melt rate of the ice and affects the overall dilution of the drink, allowing it to slowly evolve and change over the course of a leisurely session of drinking, not quite in equilibrium, but close. You can make a julep in any sort of cup, but it will not carry the same magic if it is made in a cup of lesser metals, glass or plastic. Indeed, when made in silver, the julep cup should quickly develop a crust of frost on the outside, and be cold enough that you need to wrap your handkerchief around it to keep handling it comfortably. Regular ice cubes can not be used to make a julep. This is absolute. Your ice must be crushed, and it must be crushed well. This is partly related to the same issue of technique that makes the silver julep cup more than just a pretty face, and it is deeply connected to the science of ice. Good bartenders prefer different sizes of ice for different applications and for good reason. Larger, very dense cubes are excellent for shaking cocktails and for serving many shaken or stirred cocktails over ice, as their relative lack of meltable surface area allows for good control of dilution. For stirring drinks, those cubes are often cracked to create more exposed surface area that will melt a bit faster. With crushed ice, you create massive amounts of meltable surface area, and in a drink like the julep that calls for a rather healthy slug of booze and not much else, that crushed ice fulfills two important duties—rapid chilling of the drink and, in conjunction with the metal cup, a somewhat controlled dilution that keeps the drink from becoming too watery if it is drunk at the appropriately leisurely julep pace. If you’re having a lot of people over for juleps, your local Sonic may be of assistance in this regard, otherwise, break out your ice crusher of choice and have at it. One, the julep is one of those rare occasions where it is acceptable for an adult to consume a beverage with a straw. When properly kitted out, a julep will be topped by a bouquet of mint with the straw almost hidden amongst the leaves. As the drinker lifts the glass to his face, the mint will unleash a wave of mint aromatics before the drink is even sipped. And, of course, all that crushed ice will come tumbling into your lap should you try to drain the glass of the last of your julep without aid of a straw. Two, as with the mojito, you do not need to brutalize your mint. Be gentle. Let the aromatics out, but keep the bitter, vegetal chlorophyll inside the leaves. Three, if you’re having a group of people over, you can cheat and make yourself a mint syrup in advance, rather than go through the fuss of muddling each drink. It’s not quite as good, but it is close, and it is advisable for things like Derby Day. For every two cups of sugar, add one cup of water and bring to a boil, stirring to dissolve the sugar. Remove from the heat and toss in a healthy handful of mint leaves for each cup of sugar. Allow to steep for 24 hours or so and strain out leaves. A half ounce or so in each drink will do. Add the sugar and water to a 9-10 oz. glass and stir to dissolve. Lightly press the mint into the sugar water, to release its aromatics, fill the glass with crushed ice until it mounds over the top and add your spirits. Top with a sprig of mint. How shall it be? Take from the cold spring some water, pure as angels are; mix it with sugar till it seems like oil. Then take a glass and crush your mint within it with a spoon – crush it around the borders of the glass and leave no place untouched. Then throw the mint away – it is the sacrifice. Fill with cracked ice the glass; pour in the quantity of Bourbon which you want. It trickles slowly through the ice. Let it have time to cool, then pour your sugared water over it. No spoon is needed; no stirring allowed- just let it stand a moment. Then around the brim place sprigs of mint, so that the one who drinks may find the taste and odor at one draft. Then when it is made, sip it slowly. August suns are shining, the breath of the south wind is upon you. It is fragrant cold and sweet – it is seductive. No maidens kiss is tenderer or more refreshing, no maidens touch could be more passionate. Sip it and dream-it is a dream itself. No other land can give you so much sweet solace for your cares; no other liquor soothes you in melancholy days. Sip it and say there is no solace for the soul, no tonic for the body like old Bourbon whiskey." Follow Bill's Cocktails With Mad Men series here. 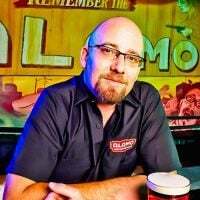 Bill Norris is the beverage director for the Alamo Drafthouse, The Highball, 400 Rabbits and Midnight Cowboy. Before joining the Drafthouse family, he tended bar in New York, London and Austin and created award winning cocktail programs at FINO and Haddingtons. His novel Snapshots, was published in 2001, is currently out of print, and can be purchased for a mere one cent on amazon.com.